The 1960s were a time of huge cultural upheaval in America. From the Civil Rights movement to the counterculture of the late 60s and the Summer of Love, the times, they were a-changin'. Unfortunately, this wasn't reflected heavily in the commercials of the time. Advertising tropes from the 50s were still reflected in the commercials of the next decade, such as black and white ads and longer commercials, but there were still some interesting changes. 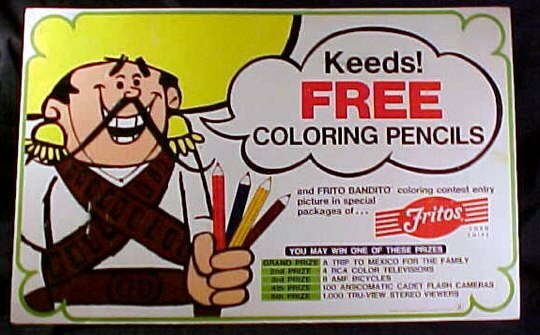 Advertising aimed at children became prevalent, and characters were created for brands specifically to appeal to the younger set, such as the Frito Bandito (pictured above). Commercials were also becoming more colorful (literally), and, unsurprisingly, space was a big theme in 60s advertising. Below, some of our favorite commercials from the era. Cultural Sensitivity in the 60s: Non-existent. Despite the gains being made by the Civil Rights movement, there was still a long way to go towards cultural sensitivity in mainstream media. Perhaps Jell-O thought adding a little "Asian flair" would make them seem more worldly, but in hindsight, this commercial is more embarrassing than Mickey Rooney in Breakfast At Tiffany's. 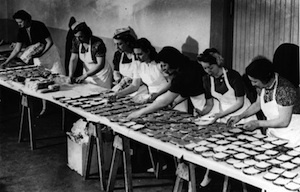 In the 60s, home-cooking got more adventurous as housewives began experimenting with cuisines outside their own cultures, and grocery stores started carrying the ingredients that would allow them to do so. This La Choy ad from the late 60s — featuring Delbert the La Choy dragon — also happens to be one of the earliest appearances of Jim Henson's muppets. Unfortunately, not even a muppet can make La Choy chow mein seem like a good idea. Kicked off by by 1959's Gidget, beach movies became all the rage in the 60s. Light-as-a-feather plots dealing with teenage problems like bikinis and boys became popular, and Dr. Pepper capitalized on this movement with this swingin' techincolor commercial. In the 1960s, the Space Race was on, and everyone was captivated by astronauts. This Tang commercial exploits that interest to the fullest extent by pointing out the similarities between children drinking Tang and the astronauts on the Gemini spaceflight. Except maybe Tang tastes palatable in space. Advertisers began to realize the benefits of advertising straight to children. This ad exemplifies this with a colorful cartoon featuring burgers and fries from Burger King, where "kids are king." This ad for Fritos, featuring the inexplicably popular Frito Bandito could quite possibly exemplify everything that advertising was about in the 60s: Borderline-racism lite? Check. Space? Check. Aimed directly at kids? Check.